Switzerland is famous for over 400 varieties of cheese, so on a trip to Bern, Edward F. Nesta and I visited the Emmental Exhibition Cheese Dairy to learn about the art of making cheese, Swiss-style. The Swiss have a long history of making cheese dating back 2,000 years. 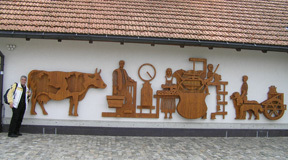 In order to demonstrate the art of making cheese the old-fashioned way, the Emmental Exhibition Cheese Dairy (Emmentaler Schaukäserai AG) opened to the public in 1990, when they outgrew the original dairy. We visited the Emmental Exhibition Cheese Dairy in October 2006, and as cheese-lovers, we were intrigued with learning about this ancient art of turning milk into solid food. 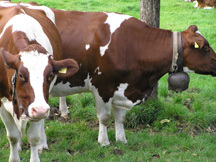 The Swiss are very particular about their cheese and the care of their cows, which produce 99% of Swiss cheese. They are so particular in fact, that Swiss law requires that cows go outside at least 20 days of each month where they must seek their own food, and not fed silage. In the summer time, the farmers bring their cows up to the Alps where the cows can graze on a gourmet selection of 120 different herbs as opposed to the 12 varieties of herbs that grow in the valleys, and bring the cows back down the mountains in the autumn around October. Who ever heard of "summer camp" for cows? Anyways, the resulting milk from the rich herbal diversity of their diet produces highly desirable Alpekäse (Alpine cheese) and butter. Alpine cheese is very healthy and can lower your blood pressure. In addition to the difference in taste between Alpine and non-Alpine cheese, there is also a color difference. Alpine cheese has a light yellow color from the herbal diet consumed, and non-Alpine cheese (made during the winter) has a lighter ivory color. There are over 400 varieties of cheese produced in Switzerland, consisting of extra-hard, hard, semi-hard, semi-soft, and soft cheeses, and 50% of all cheese produced in Switzerland is exported. A variety of extra-hard cheese is Sbrinz. The most famous of the hard cheese variety is Emmentaler (Emmental), commonly referred to as Swiss cheese. Other varieties of hard cheese include: Gruyère (or Greyerzer), Berner Alpkäse (Bern Alpine cheese), and Schabziger (Sapsago). An interesting fact that we learned at the Emmental Exhibition Cheese Dairy is that if someone is lactose intolerant, hard cheeses like Sbrinz, Emmentaler, and Gruyère cheese can be eaten without a problem. Semi-hard cheeses consist of Appunzeller, Bünder Bergkäse, Mutschli, Raclette, Têde Moine, Vacherin Fribourgeois, and Tilsiter (Royalp Tilsit and Tilsit Switzerland). Semi-soft cheese consists of Vacherin Mont d'Or and Formaggini, and soft cheese consists of Gala. 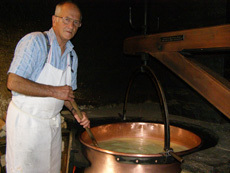 The best example of making cheese the old-fashioned way is in their 1741 Herder's Cottage donated from the Ballenberg Swiss Open-Air Museum for Rural Culture, where six retired cheese men make cheese at least once per day, six days per week. Ninety farmers bring their cows' milk to the Show Dairy, where they use 400 liters each day to make Stöcklikäse, (which has a smoky flavor), the old-fashioned way. The process takes approximately 2.5 hours to make the cheese, which is then cellared. The process begins with 200 liters of milk, lactic acid and rennet, and left for approximately 30 minutes for the enzymes to begin to work. The result is a pudding-like mixture. 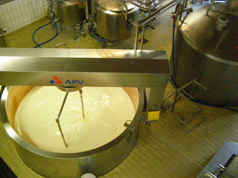 The next process requires the cheese maker to separate the water from the cheese. For the next 35 minutes or so, the cheese maker continually stirs the cheese in a large harping pot over an open fire, until the cheese curds are around the size of corn kernels. He then divides the cheese curds and places them into two wood racks, and covers the cheese. After 30 minutes, he turns and marks the cheese with the date and number. The cheese is pressed for 24 hours, and is then aged in the cheese cellar for the required allotment of time. Although groups can arrange to make their own Stöcklikäse, this cheese is not sold in the dairy store because by law, the dairy is not located high enough above sea level. The dairy checks the farmers fresh, untreated milk for quality regarding the levels of cream, butter, and water, and it is then strained and weighed. The milk is then transferred to a vat, heated to 32° C (90° F), and stirred continually throughout this process. When the milk reaches the desired temperature, rennet and lactic acid are added to the milk to curdle it, and the stirring stops. The curdling process takes around 40 minutes, and results in a pudding-like mixture that is cut into pieces using a cheese harp. The stirring continues, and as the pieces become smaller, they produce a watery liquid (whey). The mixture is heated to between 52° C - 54° C (125° F - 129° F) to remove even more of the whey. The mixture is transferred to cheese forms, and a tea bag-like paper with the dairy's label is placed on the cheese, which includes the registration number and date. The cheese is then pressed for 20 hours with a hydraulic press with pressure reaching up to two tons. 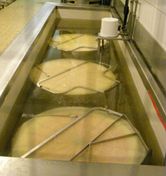 The cheese wheels are placed in a brine bath for 2 days where they lose water, absorb salt, and rind forms. The next step is cellaring the cheese in the cool brine cellars kept at 12° C - 16° C (54° F - 61° F) for 5-20 days. After the cool brine cellar period, the cheese goes to the warm fermentation cellars kept at 19° C - 24° C (66° F - 75° F) to sweat the cheese, and are turned frequently during the next 6-8 weeks. 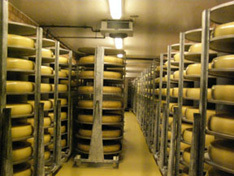 The cheese is cleaned, placed in the storage cellars kept at 11° C - 14° C (52° F - 57° F for maturation, and turned once per week during this 3-month process. 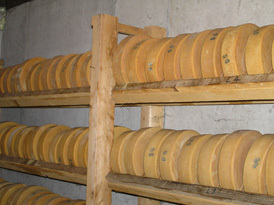 When the cheese reaches maturity, it is sold to cheese wholesale companies, where they will receive additional aging. The longer they age the cheese in the cellars, the richer the taste and aroma. Before the cheese leaves the dairy, it is checked for quality of appearance, storage, weight, aroma, taste (young Emmentaler must be creamy), and uniformity of the size and amount of the holes (must have 3-5 holes) in a tested area. Emmental cheese, produced since the 13th century, derives its name from the Emme valley in the canton of Bern. Today, there are eleven kantons (like states), producing Emmental cheese in Switzerland: Aargau, Bern, Giarus, Lucerne, Schwyz, Solothurn, St. Gallen, Thurgau, Zug, Zurich, and some parts of Fribourg. There are four types of Emmental cheese: Classic, Bio (Organic), Réserve, and Höhlengereift (Cave-aged). Classic and Bio (Organic) are aged for a minimum of at least 4 months in dry cellars. Réserve is aged for a minimum of at least 8 months (considered mature), and Höhlengereift (Cave-aged) is aged for a minimum of at least 12 months (considered fully mature). The shorter the aging process the milder the cheese. Full flavor develops as the cheese matures, and the texture changes during maturation. Classic and Bio (Organic) have smooth textures, Réserve has a fine, crumbly texture, and Höhlengereift (Cave-aged) has a soft, crumbly texture. The famous holes in Emmental cheese are highly regulated, and all holes must be between the size of a 20-cent Swiss coin (about the size of a cherry) and a two Swiss Franc coin (about the size of a walnut), and must have between 3-5 holes in a tested area. To be an AOC Emmentaler cheese, the cheese must have regulation size holes. 100 grams (3.5 ounces) provides 125% of the daily calcium requirements of adults, 80% phosphorus, 33% Vitamin A, 25% Vitamin D, has no carbohydrates, is low in salt (0.5 grams), has 29 grams of protein providing 50% of the daily protein requirement for adults, and 30 grams of milk fat. All Emmentaler cheese is marked with the registration of the dairy, and the date that they produced the cheese. After taking the tour of the show dairy, we stopped in the Dairy Store to sample the cheese, which naturally, is the best part of the visit. We sampled Classic and Bio (Organic), which were mild with a walnut taste, Réserve, which was sharp and spicy, Höhlengereift (Cave-aged), which had a rich aromatic flavor, and Uralt, (aged for 18 months), which was drier, full of flavor, and our hands-down favorite. We liked this cheese so much that we purchased a large portion of Uralt, went to their Bakery and Confectioner's Shop and purchased fresh bread, sat outside at a table, and enjoyed our cheese and bread, thinking, if only we had some wine, it would be perfect. Eat cheese, drink wine, be healthy, and be sure to visit the Emmental Exhibition Cheese Dairy (Emmentaler Schaukäserai AG) on your next trip to Switzerland. The Emmental Exhibition Cheese Dairy (Emmentaler Schaukäserai AG) is located 1-hour from Bern, and is easily accessible by train and bus. We took the train using our Swiss Pass from Bern to Hasle-Rüegsau and then switched to the Postbus to Affoltern. The show dairy is open 365 days from 8:30 am - 6:30 pm, with free admission. There are audio-visual commentaries available in German, French, English, Italian, and Spanish.